Brides to be, if you’re looking for fun, colorful and creative ways to dress up your barn for your wedding prepare to be delighted by today’s styled shoot! But don’t expect any rustic, vintage barn decor here, no way! This shoot took place at Jorgensen Farms in Westerville, Ohio, and features all sorts of modern, vibrant and geometric styling. Traditional barn weddings are taking a back seat to bright and bold tones and and we couldn’t be happier! Don’t you just love this barn with it’s huge yellow sliding doors, it provides the perfect pop of color as a backdrop. 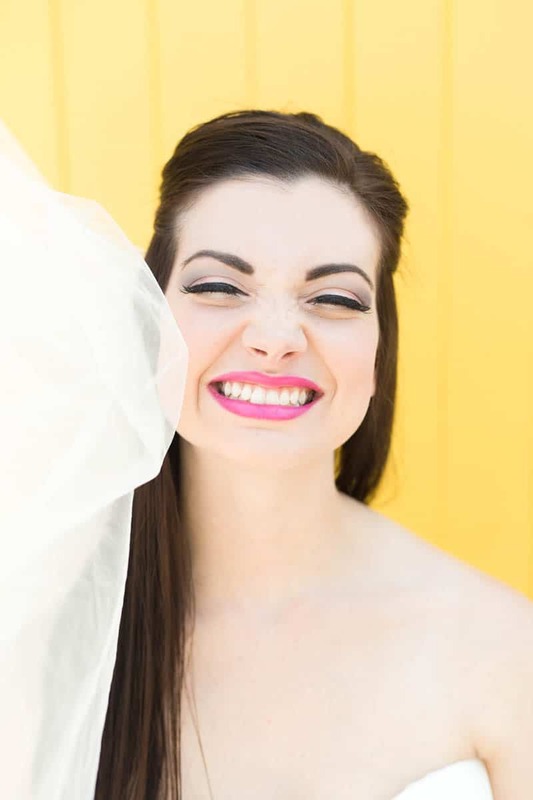 “The invitation suite incorporated the main colors of the shoot, yellow, orange, pink, and blue.” Explained photographer, Marissa. “The tablescape was more boho with an eclectic array of floral arrangements. Clear vases filled with water and food coloring are an easy and affordable way to add some color to your tablescape. A small number of flowers will go a long way when you spread them out into numerous vases. ” She added.